Greta has been trapped in Mylena, a world with goblins, gnomes, elves, and all other manner of magical creatures, for the last 4 years. During this time she’s become a bounty hunter, making a living off killing creatures that have turned. I must say I was immediately intrigued by this concept and propelled in to the world Jacobs creates. Chloe and I had a bit of a love/hate relationship. What I mean is I really liked her when she wasn’t getting on my nerves. 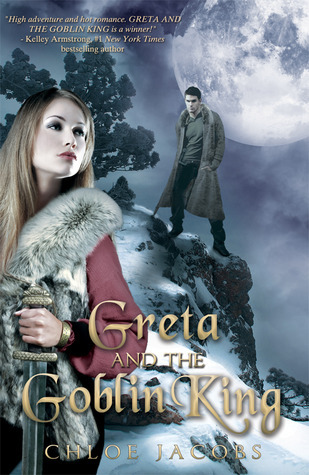 Greta is a strong heroine with a deep sense of duty. I liked this about her, but for being a smart girl she often over thinks her decisions and can’t make up her mind. This especially bothered me in the relationship between her and Isaac, the Goblin King mentioned in the title. Isaac, to Greta’s credit, isn’t the easiest character to like. Despite his swoony appearance he is a liar, and has this crazy need, or rather obsession, with protecting Greta. I alternated between wanting him to be in every scene and wanting him to just leave the girl alone. Greta repeatedly tells him to leave and he ignores her (although she does send mixed signals). This particular character trait bothered me a lot, there is nothing attractive about a guy who won’t take no for an answer, even if he is a goblin king. Overall, I did like that Greta and the Goblin King was a quick and action packed read. The novel takes place over a short amount of time but during that time a lot of things happen. I also enjoyed Jacobs world building. I felt like I was trapped in Mylena, this cold wilderness, right beside Greta. Despite the character flaws I enjoyed the story and plan on reading the next book in the series. Bonus: Since I absolutely can’t help myself, here is a gif of David Bowie from Labyrinth. This is exactly how I pictured Isaac, the goblin king. It also should be noted immediately after finishing this book I had to watch Labyrinth, which is just a good movie.